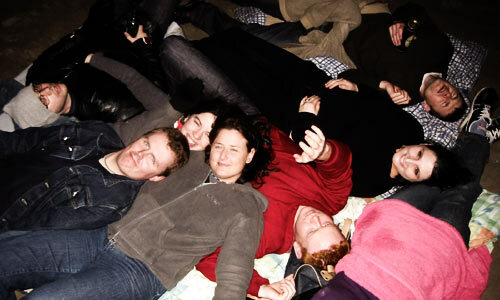 Waltzer, John, Mairead, Mandy, Brian, Triona, John and Joey lie on the beach in Iniscrone at 1am. Gillo: If tea was available on tap in the pub, I'd buy a pint. On how much he likes tea. After a later than scheduled meeting at Molly, Tri and Gillo's* place, on Saturday the first of June, we hit the road for Sligo. Me and Brian were in John Grant's car, in Mairead's car were Triona and Mandy, and in John Owens car was Jo. After hours of driving we arrive in Iniscrone, a small town on the coast. Parking in the church car park to go to the pub may have been sacrilegious on our part, but by the time we had a jar we hardly noticed the congregation coming out of the church staring at us as we made our way to the car with two bottles of Jack Daniels in tow. The restaurant was sufficient to fill us up, but we got a laugh from the bute simplicity of the place. Shabbily decorated with cheap metal school canteen style tables with plastic wood tops, kids running about like it was a cr�che, full fluorescent lighting and no ambient music. A real utility eating place. When we got to the house it was beautiful. We ran up and down it like bold kids when mammy and daddy are away. Then we were planning the party that would ensue that evening like excited teenagers with a free house. We had gone to the shop before and we put more food in the fridge and drink on the counter than I have ever seen for a party! So we settled down to eat, drink and be merry. After a few drinks, lots of chat and a few sing along songs, everyone was in great form. There were only enough comfy seats for seven, so every time someone got up for the fridge or the bathroom, the person in the wooden chair would take their place. It was a cruel system, but one that worked. The party went on well into the night, with much fun and games, and ended with a sunrise walk along the beach. The next day everyone awoke to the sound of puking and football. Some people weren't well after the whiskey yesterday. We went out to look around the shops, walk along the beach and freshen up somewhat. That evening we went out for dinner to a nice hotel, just managing to get in before they closed, and then we went to a local pub. The third day saw us kicking the ball around the garden, getting some sun, and Mandy making dinner for everyone. Some of the crew entertained themselves in the seaweed baths. Bizarrely, John McClean decided that he was going to visit. He left Dublin at 4.00 and when he arrived, John Grant ran down the road to meet him carrying a bottle of Port disguised as a box of Rice Crispies! John tucked into the food that we had left over and we settled down for another party. This time everyone was itching to go to the beach so we grabbed a few bottles and headed down. A blanket was thrown on the ground and we all lay about on it, as you can see in the pictures. It was one of those moments with your friends you'll always remember. Next day we said out farewells and headed home. I'd encourage you to go into the discussion boards and let us know what you are up to. It might not be as exciting as Jo and Tri on their way to Australia via Thailand and the Philippines, but we'd still like to know. What's with the delay on the site? Sorry for not dong the site for a while kids, I have been working on other projects. I like doing the site but I may have said before that it's a bit disheartening that it has been banned by the aul' Company and therefore anyone who hasn't escaped isn't able to see it. Nevertheless, I have many readers, from places as diverse as Portugal, San Francisco, Australia, Germany, England, New York and of course Dublin. And I hope to keep you amused with anecdotes, photos and quotes for a long time to come. Thanks for coming back after the long delay. I do appreciate your interest and enthusiasm. As you might have read before, I am going to build an arcade machine and throw in a PC running MAME, the arcade machine emulator. Then I download my favourite 80's arcade games and play away. Well I have made a significant step towards getting it going, I purchased a working arcade cabinet, which runs Golden Axe. I've been playing Golden Axe a good bit, it's pretty cool. I have to figure out the best way to get the machine running a PC instead of the Golden Axe hardware and then I'll be on the way to having an arcade machine running any game I like. If you are interested in this type of thing, check arcadecontrols.com. I will be making a special page for the project soon, linked off this page. Jo and Triona's last nigt out before Australia, a night in at Mandy's, little Conor's birthday, Kirsty's birthday and more updates. Seeya soon!